The story starts with Dinty Doyle, a cabin boy on a ship bound home to Ireland, sent to a strange island to dig up a tree for the ship’s Christmas celebration. In doing so, he releases a trapped banshee, who causes a storm, stranding Dinty, and subjecting the rest of us to incoming backstory. Instead of having much of any plot in the present, much of the special is taken up with the patriarch of a leprechaun clan (Blarney Kilakilarney, yes, really) telling Dinty about how the banshee was trapped in the first place. Once this flashback begins, we get several musical numbers about the lives of the leprechauns, both the gold-digging and the shoe-making branches of the family. These songs are okay, and the leprechaun puppets are kind of cute. Then the banshee causes a rift in the family in an attempt to get their gold. Apparently, banshees need to be given gold for Christmas, or they’ll turn into tears and wash away. Ignoring for a moment that there is so much mythologically wrong with that statement, the leprechauns have tons of gold, and before the banshee interfered, they were apparently mining more every day. The banshee is angry throughout, but doesn’t ever do anything worse than call a storm, give someone a potion of generosity, try to put a sleep spell on someone (it doesn’t stick), and disguise herself as various things in an attempt to get some gold. The leprechauns couldn’t give her a little gold? To save her life? They really come off as selfish, clannish jerks here. 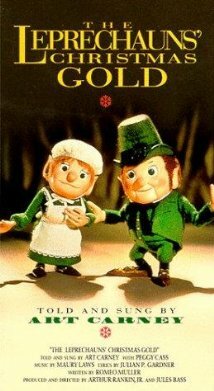 This came out only a few years after Rankin-Bass released their adaptation of The Hobbit, and the attitudes of the leprechauns here are somewhat reminiscent of Tolkien’s dwarves, minus the martial ability. Oh, and Saint Patrick is in this special as well. Sort of. He’s the lord of the leprechauns, but also a spirit, possibly, considering that he just fades in, makes some magic and fades out again. It’s like they just made a list of “Irish” things and stuck them together willy-nilly. Another example: the gold is hidden under shamrocks, because of course it is. Dinty wanders off, and the banshee comes to him disguised as a young, shipwrecked girl. In this guise, she asks him to give her the gold, saying she will use some to pay the leprechauns to build them a ship and take them and the rest of the gold back to Ireland, there to share it with friends and family and bring them a merry Christmas. Cue, at last, the reason for the special: the Christmas in Killarney musical number. It’s a fantasy montage of Dinty and the girl and all the leprechauns decorating a town in gold for Christmas. It’s cute enough. Anyway, he agrees to give her the gold (why couldn’t he just pay the leprechauns, if it’s such a good idea?) and she reveals herself as the banshee. She rushes to the secret cave where the gold is, but… it’s Christmas morning, and she is too late. She dissolves into the sea. The leprechauns apologize to each other for fighting and Dinty’s ship reappears to take them all to Ireland. The End. Sad story, really.